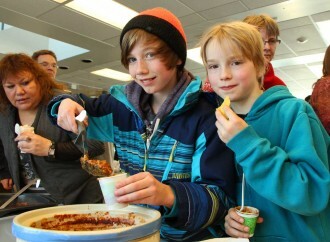 Sebastian Pickles, 11, and Leif Aubrey-Smith, 9, enjoy some “pretty hot, but good” chili at Aurora College’s Thebacha Campus during the chili cook-off Feb. 17. NWT Youth Ambassador Kyle Donovan demonstrated traditional Inuit games, including the one-hand reach, at Thebacha Campus in Fort Smith Feb. 16. Student representative on the Aurora College Board of Governors (left) Olga Aviugana and B.Sc.N student Kiana Karimi Moosai, cut the cake in Yellowknife. Sarah Tingmiak and Marjorie Elanik enjoy a laugh at an elders’ bingo at the Aurora College Aurora Campus in Inuvik.